A group of mothers of those killed in the 1989 protests in Tiananmen Square has urged China's leaders to fully investigate the deaths. Their call was issued as the 20th anniversary of the massacre approaches, and days ahead of the annual session of the National People's Congress. The Tiananmen Mothers want the government to name the dead, compensate families and punish those responsible. 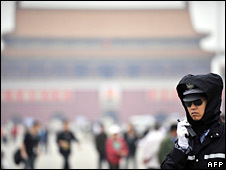 In an open letter, Chinese leaders were also urged to "break the taboo". Those involved in China's rights movement say few young people in China know about or understand what happened. The Tiananmen mothers want the government to seek and reveal the truth behind the decision to send tanks and troops to crush the student-led peaceful protests on 3-4 June 1989, which were seen by the leadership as a threat to Communist Party rule. Hundreds - possibly thousands - of people were believed to have been killed, but the government has never allowed for a full accounting of the events. "This will require each deputy to demonstrate extraordinary courage and resourcefulness, political courage and wisdom, to break the taboo and face head-on the unspeakable tragedy that took place 20 years ago and resolve 'June Fourth' with the truth," said the letter, referring to delegates to the annual legislature. "China has become like an airtight iron chamber and all the demands of the people about June 4, all the anguish, lament and moaning of the victims' relatives and the wounded have been sealed off," it said. The activist group has released a version of the letter every year for two decades. The latest comes during an especially sensitive year, when the Communist Party faces several potentially volatile anniversaries, including the 50th anniversary of the Dalai Lama's flight into exile from Tibet. China initially denounced the 1989 protests as a "counter-revolutionary" plot but now tends to call it a "political disturbance" and avoids extensive comment.